It is a pleasant day in January at the Sri Venkateswara University in Tirupati, Andhra Pradesh, and the campus is teeming with activity. Over 18,000 people have arrived at the 104th Indian Science Congress to deliberate over advancements in science and technology. But a passionate discourse on the subject hardly seems to be on the minds of the attendees. Many scientists, their families in tow, present their papers to half-empty rooms and move on to tour the city. Researchers ask each other if they have visited the famous Venkateswara temple yet. And students hang around the grounds, clueless about which sessions to attend. There are no clear directions to the venues of different sessions. It is clear that the annual event, organised by the Indian Science Congress Association, is a washout. 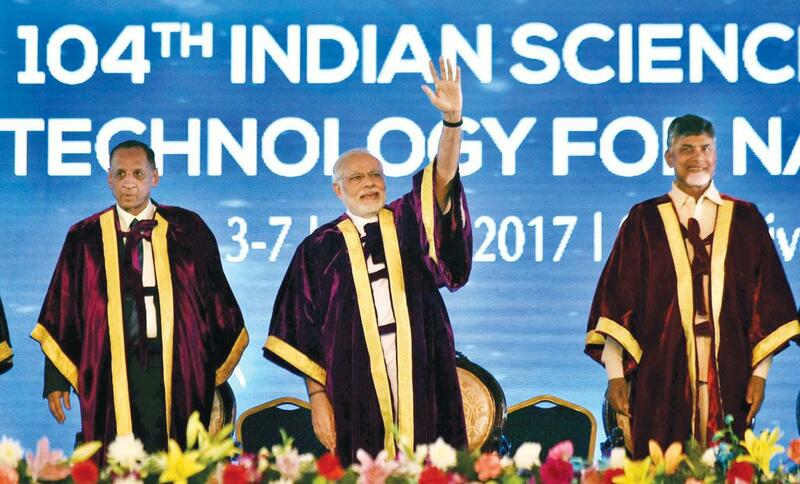 Though the science congress begins as expected—it is inaugurated by the prime minister and boasts of lectures by Nobel laureates, such as crystallographer Ada Yonath, theoretical physicist Kip Thorne and economist Muhammad Yunus—it soon loses steam. The topic chosen for this year’s congress is “science and technology for national development”, a theme so wide and ambiguous that the subjects discussed have no clear direction. Review papers, which are only summaries of existing research, eat into the time that could have been better used for presenting original research. Most of all, the congress fails to achieve the aim for which it was started—to instil passion and curiosity for science in the minds of people. Scientists present over 1,000 papers during the five-day event, but their presentations fail to engage the interest of the participants. Though schoolchildren attend the science exhibitions in hordes, no efforts are made to explain to them the innovations on display. “Today’s science congresses do not advance the cause of science. In fact, the reverse seems to be happening,” says scientist and former administrator M S Swaminathan. “Young students are disappointed by the casual attitude of seniors who come only to deliver their lecture and leave. There is no interaction with the young scientists at the event.” Swaminathan, who was general president of the 1976 congress held in Waltair (now Visakhapatnam), also points to the decaying management and spirit behind the event. “Today, the main emphasis of the congress is to give awards, hold cultural programmes and elect office bearers. Even the elections are not merit-based. Instead of electing giants in science who will inspire the younger generation, the president is elected on the basis of canvassing,” he says. The science congress used to be a prestigious event. It was first organised in 1914 by two British chemists, J L Simonsen and P S MacMahon, who thought that an annual meeting of scientists would help stimulate scientific research in the country. Since then, it has been presided over by doyens of Indian science, such as Prafulla Chandra Ray, founder of India’s first pharma company, and Jagadish Chandra Bose, the scientist who proved that plants respond to stimuli. Over the years, the congress chose pointed subjects for discussion, including relativity; the Raman Effect (the scattering of a light beam when deflected by molecules); cholera research; and vegetation of the Himalayas and Tibet. From 1976, the congresses started following the practice of choosing focus themes for each year. The science congresses also brought about change. Swaminathan recalls that the recommendations of the 1976 Indian Science Congress—which emphasised the role of science and innovation in rural development—were presented to the deputy chairperson of the Planning Commission on the last day. They made their way to the then Union finance minister, C Subra maniam, who introduced these recomme ndations in his budget speech in February of that year. He also allocated an adhoc amount of Rs 15 crore for the purpose in the financial year 1976-77 and expressed hope that the scope of the programme could be expanded in the following years. Former president of the 2007 congress and noted seismologist, Harsh Gupta, remi nisces about the buzz that the 1990 congress had created in Kochi, Kerala. “The whole city became involved in the event. The exhi bition was put up a full month in advance, creating curiosity and interest among the city residents. This brought a larger number of people to the main event,” he says. Both Gupta and Swaminathan say that there should be serious discussions about the future of the science congress. While Swaminathan suggests that all the science academies in the country should develop unanimous recommendations for the way ahead, Gupta says the Department of Science and Technology must set up a committee of revered scientists who have presided over past science congresses. The recommendations of the committee should be implemented by the Union Ministry of Science and Technology. Now, one can only hope the government is listening. The congress must focus on quality instead of quantity. It must do away with parallel sessions on different sciences and, instead, encourage interdisciplinary sciences by choosing the best papers in each subject for presentation at a common session. The congress must abolish review papers and promote original research. The Indian Science Congress Association should publish such original research and strive to become a prestigious platform for publishing. Instead of generic themes, the congress must choose specific themes which are linked to pertinent issues facing the country. All lectures should remain faithful to the theme. All abstracts, papers and videos of presentations must be stored and shared in a digital format to improve access and transparency. Session moderators must guide sessions ably, stepping in when language falters to quickly paraphrase participants' questions and making them crisp and to the point. Ample time should be provided for the question-answer sessions and participants should be engaged with short quizzes after each session. Government institutes should be invited to present their latest research to ensure their commitment to their work. Institutes should assign teams to their stalls in the exhibition to explain their work to visitors, especially schoolchildren. As far as possible, the congress should be held in public universities to encourage their students. Holding them in small cities is also a good idea as it would help inculcate scientific temper in local residents. Recommendations from the meeting should be presented at the valedictory function. The following year, the prime minister or, at least, the general president should speak about the action taken on the recommendations.